MakerBot #131 has finished printing the parts for a RepRap Mendel! It’s got 96 printable parts. You can find the details here. 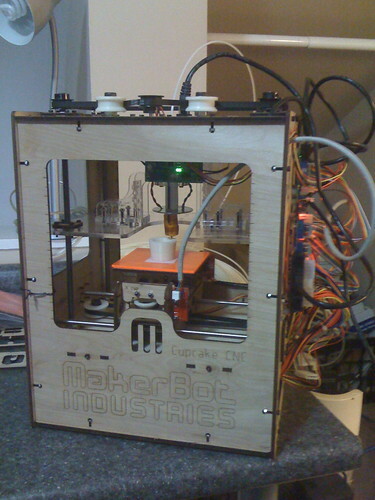 The MakerBot 3D printer is the a super-cheap, super-hackable 3D printer. An extruder, mounted on a Z-stage that can move up-and-down, melts plastics like ABS (a la Legos), HDPE (milk jugs), and PLA (biodegradable plastic made from corn! ), and deposits it on the build platform, which can move in 2 directions. In this way, it can build up 3D objects layer by layer!